Several members of the TNT Gymnastics Club in Mauston carry a large mat across the club's new practice facility at 249 East State Street. The club started its winter/spring season on Tuesday with a practice session. Trinity Delaney receives a lesson from TNT Instructor Danielle Mueller during practice on Tuesday at the club's new location at 249 East State Street in Mauston. Danielle Mueller, instructor for TNT Gymnastics in Mauston, teaches Hannah Bunker a balancing technique during practice on Tuesday. The club opened its new season at a fresh location, taking residence at the old Clement's Furniture Store in downtown Mauston. The youth club is holding practice sessions at the old Clement’s Furniture Store at 249 East State Street. TNT, which has four gyms spread across southwestern Wisconsin and northeastern Iowa, has seen its numbers grow since coming to Mauston in the summer of 2014. For the past three seasons, the club practiced in a cramped balcony at Grayside Elementary School. The Mauston Wrestling Club is in the process of purchasing the old furniture store and TNT will rent the space from the club. The club’s winter/spring season began on Tuesday and will run for 16 weeks, ending on May 23. The gymnasts will meet once a week to practice for a couple hours. For the winter/spring season, about 100 gymnasts have joined TNT’s Mauston club. The club has class sessions for tots (ages 3-4) to the advanced level, which includes high school-aged students. Mueller said the new location will help keep practices fast-paced, fun and engaging, which is one of TNT’s biggest goals. The club has several competitions scheduled for the season, including a home meet on Saturday, Feb. 18 at Mauston High School. TNT also has meets scheduled in Milwaukee, Madison and Dubuque, Iowa. This year’s state meet will take place in Elkhorn in March. 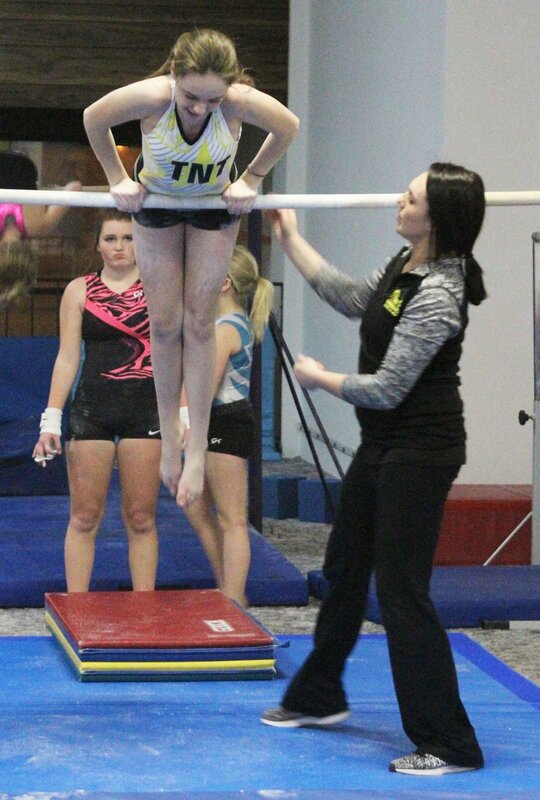 Mauston High School doesn’t have a varsity team, so TNT allows young girls interested in gymnastics to learn the sport and compete at a high level. Trinity Delaney and Julia Kitch, both 12-year-olds from Mauston, are excited for another season with TNT. Kitch, who has competed in gymnastics for about six years, is pleased to have a nice facility in Mauston. Prior to that, Kitch traveled to Reedsburg to compete. This season, Kitch is looking forward to showing off her skills at the Harley-Davidson Invite in Milwaukee. The meet, in February, will feature many club teams from across the state. Delaney, who is entering her third season in gymnastics, is looking forward to improving a few techniques this spring. Delaney, who counts Olympic gold medalist Shawn Johnson as one of her idols, enjoys TNT and plans to continue with the sport through high school. She’s tried other sports, but always goes back to the mat. For more information on TNT Gymnastics, go to www.tntgymnasticswi.com or send an email to Mueller at tntgymwi@gmail.com.